Intellectual property law covers rules and regulations regarding trademarks, copyrights, and patents. The bulk of this area of law is laid out in federal statutes as copyrights under the Copyright Act, patents are covered in the Patent Act, and trademarks are protected under the Lanham Act, or Trademark Act. As there is such a wide range of law under these three acts, keeping it all straight can be confusing. To make it a bit simpler, here is a glossary of terms for patent law. Abandonment: A state of a patent application when there has been a failure to file a complete and proper reply as required under patent law. The term can apply to the application or the invention. Assignment: When the ownership of a patent or a patent application is transferred from one entity to another. All assignments must be registered with the Assignment Services Division of the United States Patent and Trademark Office so that there is a clear title to pending patent applications and patents. Certificate of Mailing: An official document certifying that a piece of correspondence was mailed prior to the deadline for response and stating the date of any included deposit. Disclosure Document: An official document that serves as evidence of the invention’s date of conception. Enforceability of Patent: A patent owner’s right to bring an infringement suit against someone who makes, uses, or sells the patented invention without permission. This suit is typically pursued with the help of an intellectual property attorney. Non-Obviousness: A requirement that the subject matter of the sought-after patent must fulfill. To be non-obvious, the invention must be sufficiently different from what has been used or described before it in the eyes of a person who has ordinary skill in the invention’s field. Patent Infringement: The unauthorized making, using, offering to sell, selling, or importing into the U.S. of an invention that has been patented. Practitioner: The person who stands for or acts on behalf of another person. An intellectual property attorney, patent agent, or patent lawyer may represent the inventors named in a patent application. Specification: A written description of the invention, as well as the process and manner of making and using the invention. 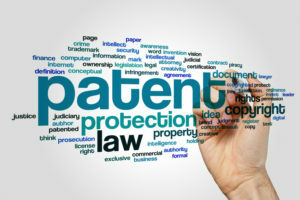 Whether you are seeking patent services in the application for a new patent or looking to defend your patent that already exists, contact an intellectual property attorney to ensure that you go about the law in the correct way.